The Milky Way through the constellation Cygnus. The dark cloud bisecting the Milky Way is the Great Rift. In the late days of northern summer, the constellation Cygnus lies nearly overhead in the mid-evening hours. A long, conspicuous constellation, Cygnus stretches along the diffuse arc of the Milky Way and is packed full of lovely deep-sky objects for stargazers of all skill levels. Cygnus is an ancient star group and goes back at least 2,000 years. In Greek legend, Cygnus was a friend of Phaeton, the son of Helios, the Sun god. Phaeton met his demise while foolishly trying to drive his father’s sun-chariot across the sky. When Phaeton fell into the river Eridanus, Cygnus begged Zeus to turn him into a swan so he could fly down to retrieve his friend’s body. In doing so, however, he gave up his immortality. Zeus was touched by the selfless act of Cygnus in honoring his friend, so he cast the swan in a place of honor in the night sky. The main part of the constellation Cygnus forms the asterism known as the “Northern Cross”, with Deneb (α Cygni) at the top of the cross and Albireo (β Cygni) at the base. The center of the cross is the star Sadr (γ Cygni), and the tips of the arms of the cross are marked by δ Cygni to the northwest and Gienah (ε Cygni) to the southeast. When viewing Cygnus as a swan, Deneb marks the tail, Albireo the nose, and delta and epsilon mark the wingtips. From Deneb to Albireo, the constellation spans about 22o. A map of the constellation Cygnus showing the objects in this sky tour. Let’s look along the backbone of the Swan from Deneb to Albireo and stop to see a few sights along the way that are worthy of inspection on a northern summer evening. (Note: These sights are also visible from most populated parts of the southern hemisphere where the constellation is visible over the northern horizon in the mid-evening hours in August through October). Deneb. At magnitude 1.3, alpha (α) Cygni ranks as the 19th-brightest star in the sky. It is one of the intrinsically brightest stars known, with an absolute magnitude of -8.4. It is too far away for an accurate determination of distance, but astronomers believe Deneb to be 50,000 to 200,000 times brighter than our Sun and 20 times as massive as our Sun. Deneb is a white type A2 Ia supergiant and was once likely a blue-white O-type star before it ran out of hydrogen fuel in its core. It’s now quickly evolving into an M-type red supergiant. Sadr. Another supergiant star, Sadr or γ (gamma) Cygni, marks the chest of the Swan. This whitish-yellow star lies about 1,800 light years away and outshines our Sun by a factor of 33,000. Sadr is only about 12 million years old and, like Deneb, it won’t last much longer before it detonates as a supernova. IC 1318. Near Sadr lies a complex region of nebulosity, the brightest of which is IC 1318. This cloud of gas is set alight by an energetic Wolf-Rayet star nearby. Just half a degree to the northwest of Sadr lies an open star cluster NGC 6910. This Y-shaped cluster features two 7th-magnitude yellow-white stars at the top of each tip of the “Y”. The entire region spans about 3º. Dark sky and a good nebula filter help you glimpse IC 1318. The region around the star Sadr or gamma Cygni, just left of center, including the nebulosity of IC 1318 and the Crescent Nebula, NGC 6888, at bottom right. Image credit: Terry Hancock. Crescent Nebula. Yet another nebula energized by a Wolf-Rayet star, the Crescent Nebula is an ethereal and challenging sight in a small scope. The nebula, cataloged as NGC 6888, is about 1/3 of the way from Sadr to the star Eta Cygni. 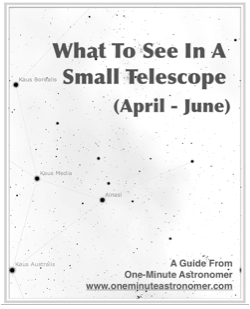 A 4″ or larger scope, a good nebula filter, and dark sky will reveal the little nebula visually. It looks like the number ‘3’ or the ‘euro’ symbol €. Near the midpoint of the nebula you can see the 7th-magnitude Wolf-Rayet star that’s generating an intense stellar wind. Eta Cygni. Further along the backbone of Cygnus lies the star eta (η) Cygni. At a distance of 135 light years, this star is much closer than Sadr or Deneb and is far less intrinsically bright. It has a mass of about 2.5 suns. It’s also getting a little long in the tooth. The star has run out of hydrogen in its core and started to burn helium into carbon, swelling into a red giant in the process. Albireo. This is one of the finest double stars in all the heavens. Albireo is a spectacular binary star for a small telescope and a stunning example of contrasting star colors. The 3rd-magnitude component of this star shines a golden-yellow. Some 35″ away, the fainter 5th magnitude component is a sapphire-blue. Any telescope, even at low magnification, will resolve this lovely star. You might even split it in a good pair of binoculars. The Milky Way and The Great Rift. Look between the stars Sadr and Albireo for a thick and bright stretch of Milky Way called the “Cygnus Star Cloud”, an unresolved mass of stars along the plane of the Milky Way. Just west of Deneb begins “The Great Rift”, a long band of darkness that runs southwest towards the horizon and appears to split the Milky Way in two. The image of the top of the page shows the Milky Way and Great Rift through Cygnus. Grab a pair of binoculars and sweep this part of the sky to see a rich and rewarding display of countless pinpoint stars.